Imagine the possibilities of world revolution – an upheaval of design, and distribution of resources lighting the path to global peace and (relative) happiness. The largesse of this task is daunting, and has throughout history been commandeered by a few ambitious individuals. Thoughts like these swirled about in a small man with coke-bottle glasses: the inimitable R. Buckminster Fuller. Inventor, engineer, architect, theorist, orator, among many other things, Fuller was first and foremost a futurist – an optimistic man bent on improving his social, political, psychic and physical world with radical thought. His unique life and lifestyle have created an altogether compelling character of sizeable proportion, comprised of all the quirks, hiccups, and gemstone moments worthy of a Wes Anderson-inspired montage. 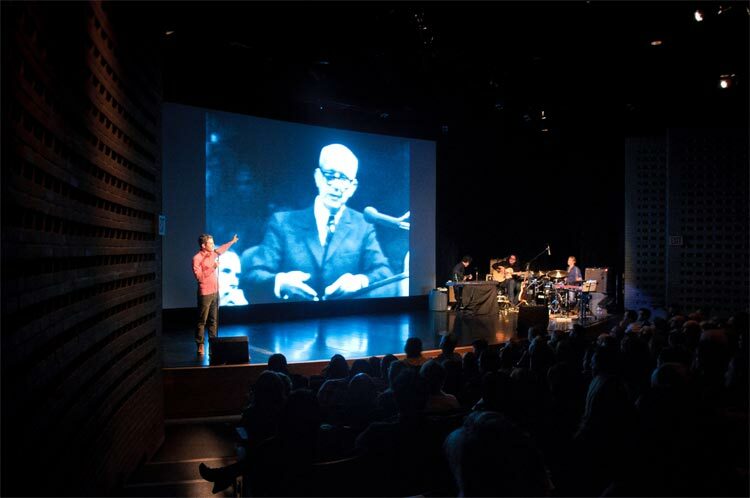 And certainly, director Sam Green’s treatment of Fuller and his life work is admirable in The Love Song of R. Buckminster Fuller, a live documentary collaboration with indie rock veterans Yo La Tengo. Like its namesake, the film was not entirely one thing, but fully engaging as a combination of several features: live storytelling, illustrative media, and apt, adept scoring. Green’s charismatic personality made for a magnetic narration – funny, quick-witted, with an underlying poignancy that he’s undoubtedly developed over his own career that’s spanned a roster of documentaries like the Oscar-nominated chronicle of the radical late ‘60s group, The Weather Underground, as well as a similarly-scoped “live documentary” called Utopia in Four Movements, that was performed at the 2010 Sundance Film Festival. The dreamy noise-pop of band Yo La Tengo was a perfect blanket for the audience to lay on and marvel at the film’s figure and his on-screen ephemera. The trio is no stranger to scores, having provided soundtracks to works like the undersea landscapes of surrealist French director Jean Painlevé. The jump seems only natural, to move from sonic illustrations of alien waters to adding color and dimension to quirky relics from Fuller’s abundant life. Their Mark Mothersbaugh-esque melody for the documentary’s opening sequence – images of a geodesic dome in flight – laid the sweet-but-slightly-kooky groundwork for the touching, strange, and extraordinary voyage that the audience is led through for the duration of the film. A concept car with a fuel efficiency of 30 miles per US gallon (7.8 L/100 km). It could transport eleven passengers, and its fastest documented speed was 90 miles per hour (140 km/h). A collection of factory-manufactured homes that could be assembled on site, intended to be resource-efficient and suitable for all sites and environments. We were introduced to Fuller’s incredible “Dymaxion Chronofile” – the largest collection of personal files belonging to any human being in history. 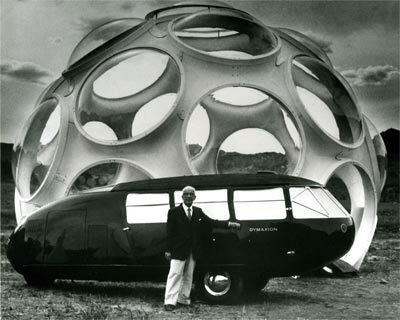 Dymaxion is a Fuller vocabulary favorite, a combination of “dynamic”, “maximum”, and “tension”, and what a better way to describe a painstaking collection of every document that the man had ever come in contact with over the course of 63 years? The cycling through of these artifacts, comprised of notes, sketches, bills, film reels, clippings, etc., made the presentation more like a PowerPoint or TED talk, rather than a simple theater outing. It’s worth saying that the program itself was short — less than an hour — which stands in contrast to Fuller’s tendency to speak for hours on end (he once delivered a 42-hour lecture, humbly titled “Everything I Know”). In that time, we see the origin of Fuller’s quest to enact change (sparked by the tragic loss of his young daughter), the boom and bust of his various innovative endeavors, and his rise to relative fame for his uncomplicated but salient vision of almost utopian, sustainable living. Green led the audience through a timeline of various ups and downs, including moments of doubt in which Fuller doesn’t appear to be as iconoclastic as one might hope. Green scans through the files, the film, and plays some archival footage alongside some interviews that create a loose sketch of the figure that is Fuller. But perhaps the most remarkable thing about Fuller is that he didn’t “achieve” much by common standards. He is mostly known for the design of the geodesic dome, which has well contributed to the field of architectural design but did not have the far-reaching effects that he had hoped for. We’re not all shacked up in domes, and our skylines are still primarily straight lines to the heavens. He was, however, a creature intensely convicted that an individual could enact palpable change in the world, and become indefatigable exemplification of the human spirit and willpower. The myth of the man was not necessarily in his actions (and in fact his resume includes a number of fantastic failures and near or total disasters), but in his ideas for sustainability and service that continue to have relevance in our world today – and that in itself is an accomplishment. It’s hard to imagine not being somewhat seduced by the mythos surrounding Fuller after his story was filtered through the thoughtful, affecting handling of Green and his musical collaborators. The tender oeuvre, in itss brief but touching run, was an elating practice in examining the extraordinary life of a man and the potential of his ideas. Those interested in examining more on R. Buckminster Fuller’s “Dymaxion Chronofile” can see more at the Stanford University’s R. Buckminster Fuller Digital Collection, which consists of audio and video materials culled and digitally reformatted from the R. Buckminster Fuller Collection at Stanford. In keeping with the educational and public service goals of Stanford University Libraries, the digital archive on this site is available without charge to registered users. Registration is free.